Chocolates are a very important detail when it comes weddings and pre wedding events in the Middle East, brides love to serve delicious chocolates to their guests, whether it is at their official marriage ceremony, henna, bridal shower, and even wedding. But brides not only want their chocolates to taste good, they also want them to look beautiful and be presented in a unique way. Arab brides love everything unique, customized, and out of the box, this is why wedding suppliers are always competing and doing their best to come up with new ideas and trends to impress the brides to be. When it comes to sweets, chocolates, and creativity, you have nothing to worry about when you are in Lebanon, because Lebanon is home to some of the best chocolate and sweets shop in Lebanon. This is why we are sharing with you some of the top chocolate shops based in Lebanon that will help you create beautiful wedding chocolate decoration that will impress everyone. Patchi, a luxury brand renowned worldwide for its delicious premium chocolate, has become the ultimate destination for chocolate gifts. From humble beginnings in Beirut to a global presence, Patchi is located today in 32 different countries, with its largest presence in the Middle East offering an exclusive and grand experience of the magnificence of chocolate gifting. 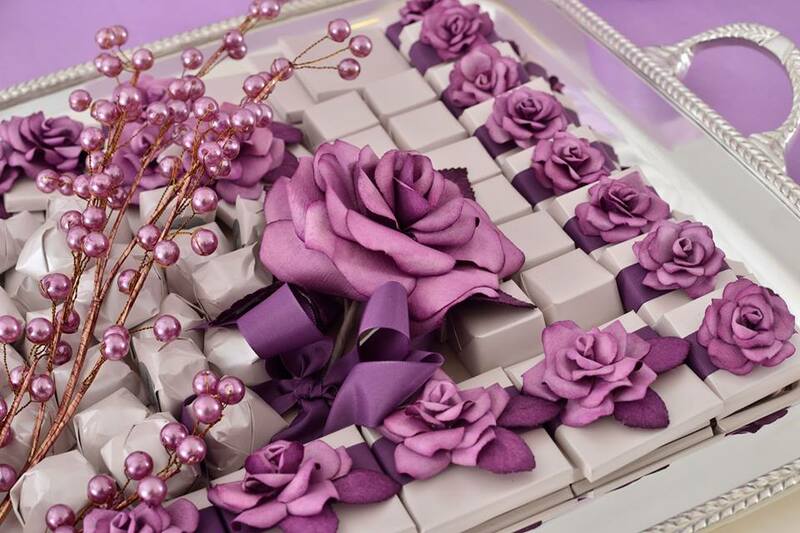 Add unique charm and romance to an exceptional event with their bridal collection of chocolate arrangements and favors exclusively for the bride and groom. Its founder, Mr. Moustapha Saade established Dandy in 1948. Mr.Saade began its carrier at the age of sixteen as a salesman in the first chocolate outlet in Lebanon. He worked there for six years and then decided to travel to Switzerland for a technical formation in chocolate, confectionery, and ice cream production. He came back with Mr. Mario Fontana (Swiss chef) and founded the factory in “Chanay”, a village in the Mountains above “Bhamdoun”. Dandy was very selective in choosing the location of its branches. It placed itself in the most vital areas of Beirut: Verdun Street. Hamra, close to A.U.H. (American University Hospital). Back in 1979, 3 leading visionaries shared a passion and set their hearts and minds on perfecting an art that took 3000 years in the making. With such a great task, fueled by their passion anddesire for excellence,Mohammad Kalaaji created the first recipe setting a standard of continuous perfection. Khalil Kawtharani, may he rest in peace, now succeeded by his son Ahmad, formed and shaped the chocolates into a variety of distinctive savory designs. Hassan Dandan was entrusted to lead and manage the company with an eye for distinctionand growth, and thus, Souchet was born. More than 30 years later, Souchet today ranks among theregion's finest chocolate manufacturers and prides itself to have shared thispassion among the millions who have savored their chocolates in Lebanon and the world. Chantilly has been inspired by the art of chocolate since 1963. Ever since, they have worked with high quality products creating our own special recipes that have been highly appreciated all over the world. With several moves during its growth and expansion, Chantilly has maintained the most modern updated confectionary facility with upmost regard to quality and standards.Remaining one of the top chocolatiers in the Middle East, offering premium confectionery while mixing tradition with state of the art technology. Chantilly's line of confectionery is not only rich in variety, but it also is the “crème de la crème” in taste. Blessing's mission is to ensure that every client receives the individual professional friendly attention he/she deserves, taking into consideration the cultural norms and values of each country where the client resides. On your wedding, engagement and special occasion, M de Noir offers you chocolate and pâtes de fruits, with shapes and flavors of your choice. M de Noir provides you as well with personalized packaging and catalogs, specially conceived for you and your special day. Born from a flame that grew over the years, M de Noir offers an assortment of noble confections made with grand chocolates and opulent ingredients, and crafted with the utmost care. Having acquired the know-how at the prestigious schools of Ritz Escoffier and Valrhona, Maya Maalouf Kanaan invites the refined and sophisticated gourmets to share her passion and melt in her unique universe of aromas and flavors. Whatever your occassion is you can find the perfect chocolates for it at Pralino. They create their chocolates with the best ingredients, and they are always presenting new and innovative ideas. Cremor was founded with a clear vision in mind to deliver luxury chocolate with great decoration services. At Cremor you can find a great collection of decorated chocolate for different occasions, along with decorated stands, souvenirs and gift items. The main source of chocolate at Cremor is Belgium, but they also have chocolate from other countries. Crystal Chocolatier is always happy to provide you with the most original chocolate decorations for wedding and newborn. They have chocolate designs that will make your choice of chocolate decoration more pleasurable. Not only are their ingredients worldclass, but they work tirelessly to catch up with the European chocolate markets in terms of advancements in chocolate. While menu, value, décor and cleanliness all play a part, it’s service and hospitality that makes that memory positive and drives customers loyalty and repeat business. It wasn’t just an idea of chocolate factory in Lebanon or a business, it was a perfect example of a dream come true. In 2007, Poème was born and it did not exceed 200 square meters. Their journey started with the objectives of not producing quantities but unique and distinct qualities of Belgian chocolate mixed with the Lebanese taste with the goal of always providing you with new tastes and new ideas to make the best chocolate in Lebanon. The most important thing about Poème is that it has succeeded since its beginning in changing the concept of presenting chocolate by working hard to provide new ideas and adding exclusive and unique flavors monthly without ignoring the old ones, as well as taking care of packaging, wrapping, punctuality, customer follow-up and assistance in all fields. The Al-Ghrawi Business Began Manufacturing A Number Of Dried Fruit, Malban And Nougat Products In 1891. At The Time, Production Was Done Solely By Hand. The Initial Products Enjoyed A Surprising Degree Of Popularity, And Have Since Become Widely Associated With Regional Celebrations And Traditions. Furthermore, The Company Managed To Successfully Introduce Their Products To The Western World, And In 1930, The Manufacturer Added Chocolate And Marzipan To Their Collection Of Sweets. With 2 Factories, 2 Retail Outlets, And 3 Facilities In Total, Today The Company Strives For More Innovation And Is Eyeing Global Expansion In Both Wholesale And Retail. Furthermore, The Company Produces And Distributes Its Finest Products To Over 30 Countries Across The World. "Nougatini" is expanding internationally. Its first shop opened in fall in Kuwait followed by Abu Dhabi, following to the rest of GCC and middle eastern countries. The Barrage daughters want to bring a whole new concept of chocolate lifestyle.Their future boutiques are places where one can indulge in the refine chocolate world through traditional yet innovative concept combining superior quality and style.